He seems the epitome of a loser -- an alcoholic who loved women and gambling; skid row bum on occasion. A man who couldn't hold a relationship together... couldn't do much of anything really...except write. And so he did. He is one of the most prolific writers of the 20th century. And throughout all 45 of his volumes, his theme runs consistently underneath like a backbeat: we are all broken and hideous...loss abounds...and beyond that... beauty. With his simple style and the honesty of his sentences, he has freed up many writers of our generation to shed all contrivances and live where we are. It sounds so basic, but it was Bukowski that insisted on it. March 9 is the anniversary of his death. His modest tombstone is inscribed with the the gloves of a fighter, and beside that, his motto: DON'T TRY. we need our rest; the great tragedy or the great victory will arrive soon enough. so I sit here tonight listening to a Vaughan Williams symphony on the radio and you too are probably sitting and waiting for something better or worse to come. waiting is the greater portion of being alive. I waited on that 8-to-one shot in the last race and he came on in the stretch rapidly closing the space between himself and the other horse at the wire, he came with a beautiful rush, pounding and driving, to fall a head short. such is the life of a gambler: to leave and then wait only to return. not all of us are gamblers and those who aren't don't matter. 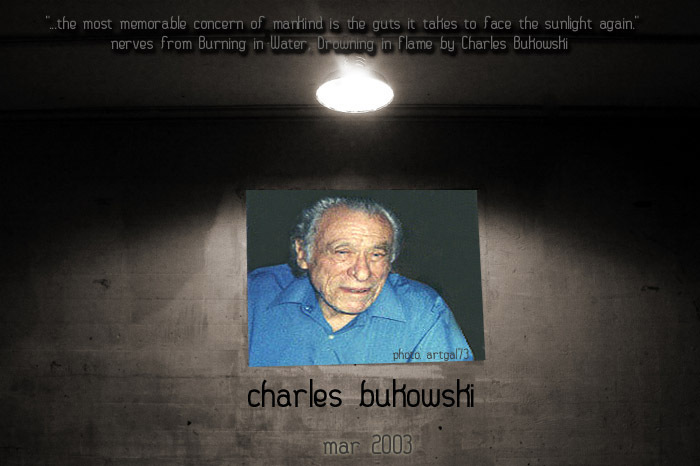 CHARLES BUKOWSKI is one of America's best-known contemporary writers of poetry and prose and, many would claim, its most influential and imitated poet. He was born in Andernach, Germany to an American soldier father and a German mother in 1920, and brought to the United States at the age of three. He was raised in Los Angeles and lived there for fifty years. He published his first story in 1944 when he was twenty-four and began writing poetry at the age of thirty-five. He died in San Pedro, California on Mach 9. 1994 at the age of seventy three, shortly after completing his last novel, Pulp (1994) During his lifetime he published more than forty-five books of poetry and prose, including the novels Post Office (1971) Factotum (1975) Women (1978), Ham on Rye (1982), and Hollywood (1989). His most recent books are the posthumous editions of Bone Palace Ballet: New Poems (1997) ; the Captain Is Out To Lunch And The Sailors Have Taken Over The Ship (1998) which is illustrated by Robert Crumb; Reach For The Sun: Selected Letters 1978-1994 (1999); and What Matters Most Is How Well You Walk Through The Fire (1999). All of his books have been published in translations in over a dozen languages and his worldwide popularity remains undiminished. In the years to come Black Sparrow Press will publish additional volumes of previously uncollected poetry.